Paradigm luxury vinyl flooring that is constructed like laminate flooring, has top layer of vinyl that looks like wood flooring, mostly wire brushed white oak. It has a lifetime residential warranty. Micro beveled edge, 7” wide planks, 60” length in planks, and a stone polymer core construction with pad attached. Trim are also available such as, Flush stair nosing, End caps, Reducers, T Molding, and quarter rounds. This collection is great for homes as well as offices with light foot traffic. This collection has a thicker “wear layer” that allow for heavier foot traffic. McCurley’s Floor Center, Inc. have been proud to offer Paradigm LVT Flooring for many years. 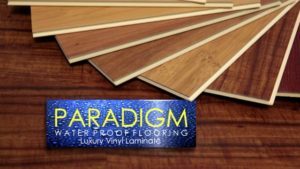 In addition to our national distributor channels, you can find Paradigm LVT Vinyl Flooring products in our showrooms in the Northern California / Bay Area at San Ramon and Concord, CA. These showrooms display a large selection of Paradigm LVT Vinyl products available for instant purchase or to be shipped nationwide. McCurley’s Floor Center is licensed, bonded, and insured, and our in-house installers have knowledge and experience with the Paradigm LVT Vinyl Flooring selection. Our professional staff can help you with any flooring project from sample selection to free estimates and consultation to delivery and flooring installation. At McCurley’s Floor Center we specialize in green and environmentally-friendly hardwood and flooring products designed for sustainability. Come visit us and see our line of Paradigm LVT Vinyl Flooring today!